When you're in a new environment or just looking to mix things up, trying a fresh running route can be a frustrating task if you're not able to link it up to your smartwatch. Plenty of devices allow you to upload GPX files so you can follow a running route from the wrist but since Apple released the Series 2 with on-board GPS, third party running apps have been vying for your standalone attention. RunGo, a free Apple Watch app, lets you build your own offline route for Series 2 users or select from 70,000 pre-installed ones as well as tracking pace, distance, splits and elevation. Premium features include live tracking for friends and family to follow along plus interval training. It isn't merely content to track you while you're pounding the pavement, though. Through its voice-assisted navigation feature, it's also aiming to become the running partner those with visual impairments turn to. We spoke to Craig Slagel, founder of Vancouver-based Leaping Coyote Interactive, to find out about the evolution of the features of RunGo, which is free with a premium sub for $1.99 a month (or $9.99 a year) subscription, and what improvements watchOS 4 will bring to the table for users. "As a runner who used to travel a lot, I always used to struggle with where to run unless someone gave me a map or directions — but even then my sense of direction is terrible," he told us. "And I thought, 'My car has a GPS, my phone has a GPS that can tell me where to go, so should my watch. "Around the same time I also adopted a retired guide dog, and I was thinking, if my dog could guide me that would be great," he said. "I had some connections with the visually impaired community after that, so I had some conversations with them and realised it'd be an idea worth exploring. We thought it would be something that could be used alongside a guide dog, and around a year after the app launched we had visually impaired users using the app." While the device quickly caught on with users who needed assistance when out exercising, the move to the wrist and conversations with members of the visually impaired community propelled the app forward. Apple's next software update, as well as offering better support for location and performance and stability improvements, will also mean RunGo can be useful on the treadmill too. "Apple has improved some of the accessibility features in watchOS4, so we're excited about that," said Slagel. "There's going to be integration with fitness machines, of course, [via GymKit] and that's something that the visually impaired athletes we speak to have told us they wanted — they want to know what the screen says when they're on the treadmill. And by syncing this data to the watch, then we can have voiceover to provide what their pace is, what their distance is and things like that." The main focus of Slagel and his team is preparing the app update for when watchOS4 drops later this year, but he has also explored expanding to Android Wear 2.0 and Tizen. "From my point of view, at least, Android Wear has been bit all over the place," he told us. "It's getting close in terms of its relevance now, and it's something we're always looking at, but because we're a small company we can't necessarily dive into Tizen and Android Wear, as well as watchOS. If Samsung was on Android Wear, it's something we could definitely see the value in." Slagel isn't content to stay within the smartwatch apps space, either, with Apple's ARKit potentially offering tools for RunGo to expand its offering further down the line. 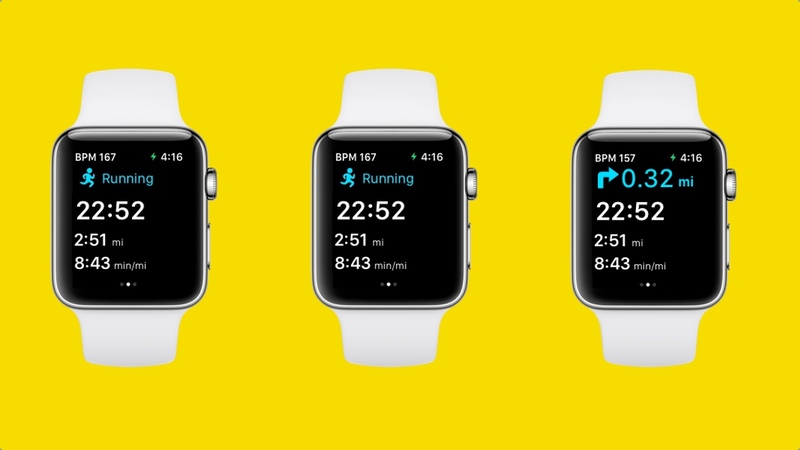 The team is already working with the iPhone SDK to develop navigation overlays for runners. As for heads-up directions, that's very much dependent on when Tim Cook and his consigliere down in Cupertino decide the much-rumoured Apple AR smartglasses are ready for launch. As RunGo wins more fans, we look forward to seeing what it does with running routes next.